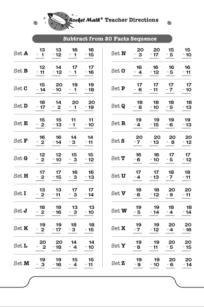 The same Rocket Math process, worksheets, routines but teaching the 10s, 11s, and 12s multiplication facts, e.g., 10 x 7, 11 x 4, 12 x 6. 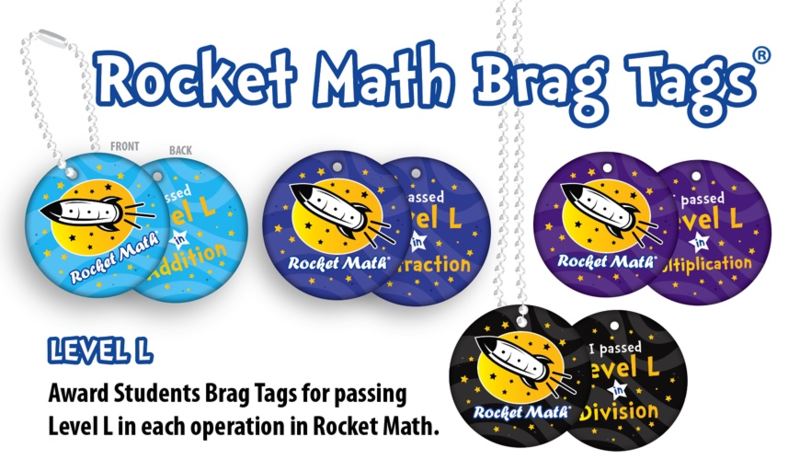 For those students who have mastered the 1s through 9s Rocket Math multiplication facts. Includes cumulative review of those facts while gradually introducing and teaching the 10s, 11s, and 12s facts. 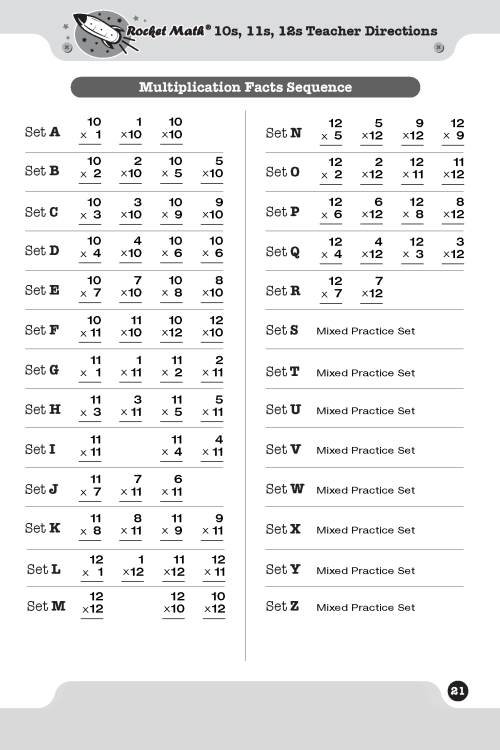 The sequence of facts practiced in Multiplication 10s, 11s, and 12s can be seen to the left. 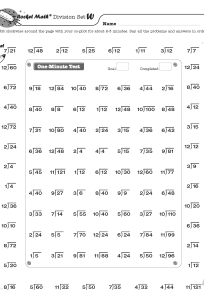 The same Rocket Math process, worksheets, routines but teaching the 10s, 11s, and 12s multiplication facts, e.g., 10 x 7, 11 x 4, 12 x 6. 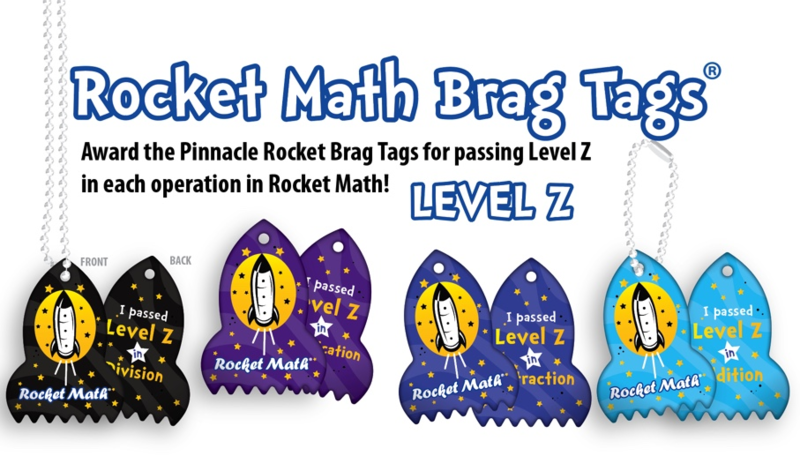 For those students who have mastered the 1s through 9s Rocket Math multiplication facts. Includes cumulative review of those facts while gradually introducing and teaching the 10s, 11s, and 12s facts. 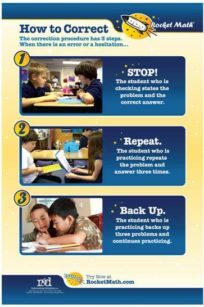 Skip counting is the best way for students to prepare for multiplication. Students practice with a partner who has the answers. Because of the way the rockets go around the page, students and their checkers will have to pick up the pages and turn them as they are working. You'll be able to see if they are really engaged and they will have fun turning the page around. Students learn part of each sequence on a page, then the next page they learn the rest. For example: in Set O students learn to count by 3s to 12, then in Set P they learn to count by 3s to 21, and then in Set Q they learn to count by 3s to 30. The test in the center has them write the count-by series they have learned for one-minute and they need to meet or beat their best–just like the rest of Rocket Math. 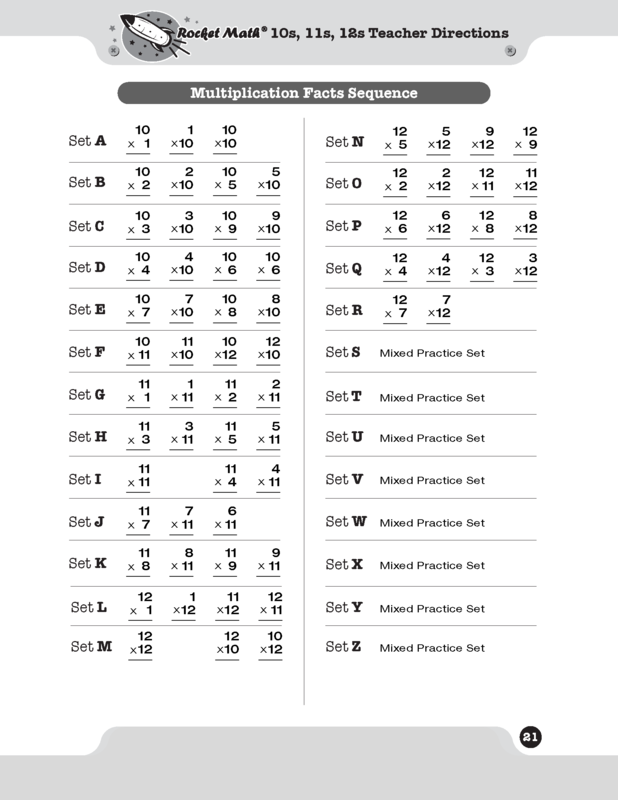 Here is the sequence students will learn in this order: 2s, 5s, 10s, 9s, 4s, 25s (so they can count quarters), 3s, 8s, 7s, and 6s. Probably our most fun product. Be ready to start right away! 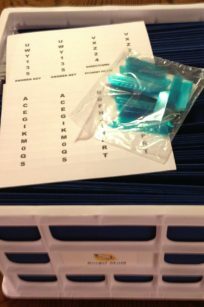 Here is all you need to organize Rocket Math for six classrooms: the file crate, 34 hanging folders AND preprinted labels for six teachers. You don’t need to make an extra trip or to spend your own money getting organized–we ship it to you without a shipping charge.